Before we even start, this drink is insanely delicious and the post contains a Neil Young link. You have been warned. We’ve been looking to come up with a pumpkin flavored drink for quite a while and this Friday our Madtini Lab staff manage to combine several recipes and came up with a great-tasting combination. We tried two different ways to come up with the pumpkin spice syrup, including simply using pumpkin spice, pumpkin purée mixed with sugar and water or create our own pumpkin spice with pumpkin purée, cloves, cinnamon and nutmeg. Using the separate ingredients to make up the syrup was definitely a winning combination for the Madtini Labs crew. 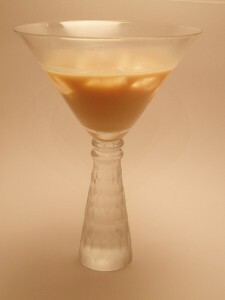 Combine the vanilla vodka, Baileys, pumpkin spice syrup in a cocktail shaker half-filled with ice. Shake, then strain into a chilled cocktail glass, Garnish with a cinnamon stick and a healthy dab of whipped cream. Combine water, sugar and pie filling in a saucepan on medium heat. Stir in cinnamon, nutmeg and cloves. When the mix reaches a consistency of maple syrup, remove from stove, let cool then store in an air-tight container. Cheers and Happy Harvest Moon drink fans. Here’s Neil Young’s gorgeous Harvest Moon to accompany your Pumpkin Spice Madtini. 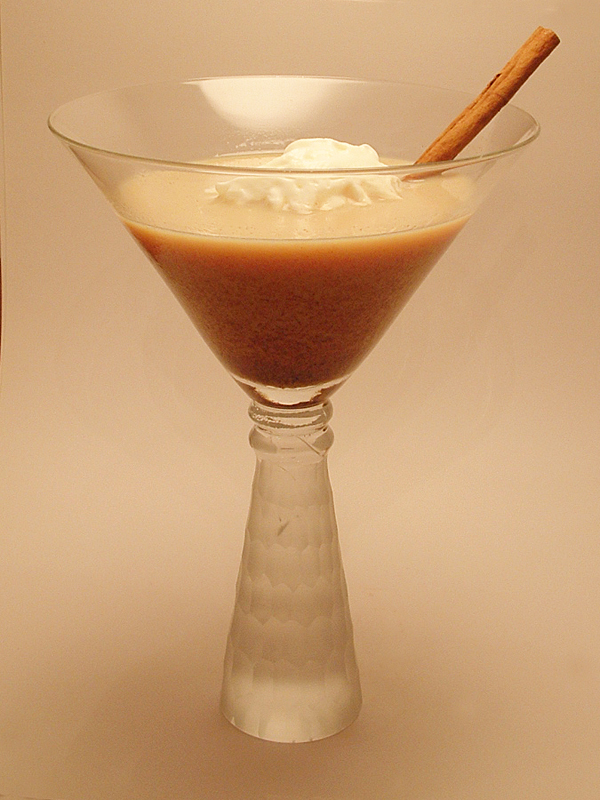 BTW, if somebody can figure out a way to get us any Pumpkin Liqueurs let me know. Well, shiver me timbers it looks like it’s “International Talk Like a Pirate Day” again already. It seems just yesterday that I was annoying friends, colleagues and strangers with pirate-ish expressions such as “Arrrrrrrrrr we having fun yet?” or “No, that’s not my wooden leg, its just the ways my pants are cut.” Talk Like a Pirate Day was created in 1995 by two non-pirates John Baur, a.k.a. Ol’ Chumbucket and his pirate-in-crime Mark Summers a.k.a. Cap’n Slappy in Albany, Oregon. It grew over the next few years, thanks to media mentions and websites featuring Pirate-Name Generators and Pirate Translators. By the way, my Pirate name came out as Pirate Argus the Pink. In the spirit of “Talk Like a Pirate Day” we’re going to drink like pirates. . . which basically means we’re going to drink spiced rum, sport eye patches and bandanas and well, basically, annoy the neighbours. 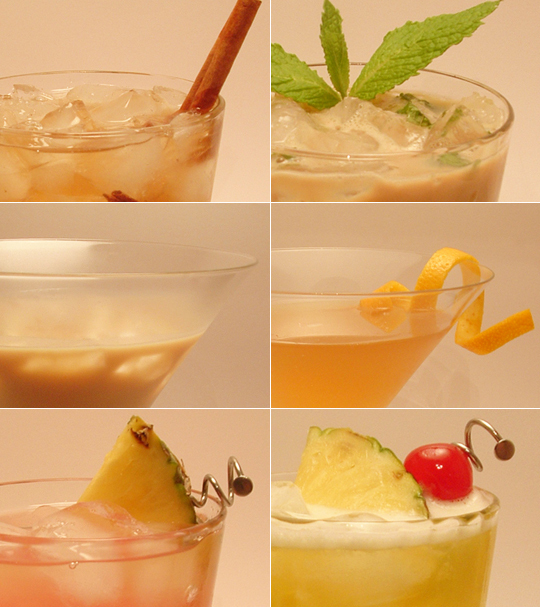 Here are six Pirate Day drinks that may just shiver your timbers. And remember guys, always pillage responsibly. So as Blackbeard said – “Damn ye, yellow-bellied sapsuckers, I’m a better man than all of ye milksops put together” – which I think means ‘Thanks I’ll have another”… or maybe not. Note: We used Sailor Jerry as the spiced rum for these drinks, for the image, the taste and the whole story behind the brand. Cheers, and glad you could join us for fancy drinks for pirates. See you next year! Secure your parrot, then combine the ingredients in a cocktail shaker half-filled with ice. Add several dashes of Tabasco depending on your tolerance to awesomeness. Shake it like you were just keel-hauled, strain and serve to your fellow pirates in a chilled cocktail glass. Last night I saw a tweet from someone drinking at the Bigfoot Lodge in Los Angeles. I did a quick search and made my way to their website – under drinks were fun sounding drinks like Girl Scout Cookie, Dudley Do-Right, Sasquatch, Smokey’s Moonshine and the Toasted Marshmallow. I remember summer Sunday nights back in Nova Scotia when my extended family of uncles, aunts and cousins would gather at a place nicknamed the Ponderosa. The Ponderosa was simply a camp on a dirt road, but it was surrounded by fields and trails through the woods. At the center of the property was a campfire pit surrounded by benches where everyone would gather to sing Kumbaya, the Cat Came Back and other campfire favorites. We’d cut our own cooking sticks, then roast wieners as the main course and marshmallows as dessert. The scars from burned lips and mouth roofs have long since healed but the taste of scalding hot fire-toasted marshmallow takes me back there even today. 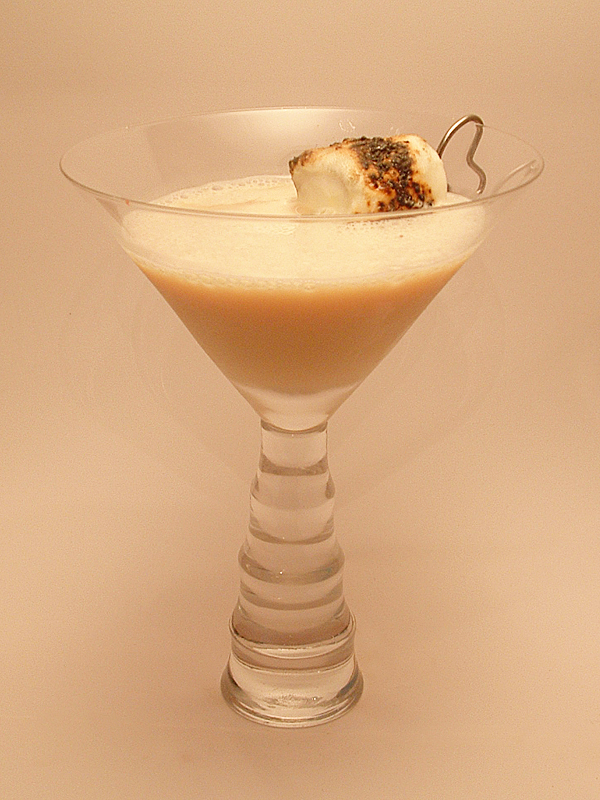 Now, I can’t say the drink tastes much like a toasted marshmallow, but it hardly matters when it tastes this good. Preparation Combine the frangelico, vodka, baileys and butterscotch schnapps in a cocktail shaker with several ice cubes. Shake and strain into a cocktail glass. Toast a marshmallow, your method is up to you. A crackling campfire works the best, but a lighter works too. I didn’t realize til this morning that the reason I was hearing crickets all night was I had left the Bigfoot Lodge web site open. It was just like the old days of sleeping out in the backyard. Cheers!